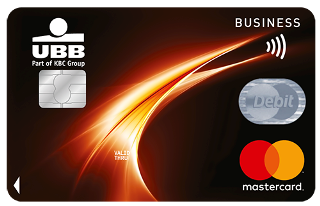 Debit MasterCard Business is a higher-class debit card, covering all standard payment and cash withdrawal methods, as well as the new contactless payment ones. The card allows easy, fast and secure payments when shopping in various commercial sites, offering contactless payment capabilities. It is the most convenient means of payment in both this country and abroad, as well as via the Internet. Debit MasterCard Business could be used for hotel bookings, car rentals, airplane ticket purchases, as well as other transactions. Contactless technology enables payments within the country by only approaching the card to a contactless POS device. Thus the card is always in your possession and your security - guaranteed. Contactless payments for goods and services in Bulgaria valued up to BGN 25 do not require confirmation by PIN code. Contactless payments – how and where? 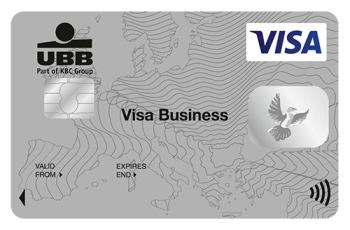 Contactless payments can be made with cards, bearing the symbol , appearing also on the new UBB Debit MasterCard Business. All the client has to do is inform the merchant that he/she will make a contactless payment and then approach and hold the card close to the device, as designated (approx. 2-3 cm.) until the terminal confirms the payment via a sound and light signal. A PIN code should be entered, if required by the terminal. POS-terminals, non-supporting contactless technology, enable standard payments – via reading chip or magnetic stripe data, upon inserting the card in the card reader. No fee for payment of goods and services at merchants in Bulgaria or abroad. No fee for card issuance. Option to deposit cash at designated UBB ATMs. Option for payment of utility bills with the card. Free-of-charge SMS notifications for each transaction over BGN 100. Option for additional free-of-charge protection of payments via Internet by activating the UBB 3-D Secure service: “Secure Card Payments in the Internet”. Tariff terms may be viewed here. In case of a lost or stolen card, you can immediately block it by calling the 24/7 hotline of UBB’s Call Center at +359 (0)700 11717 or at *7171 (for calls from mobile phones in Bulgaria). With a business card from United Bulgarian Bank you have access to funds in your company’s current account 24/7/365. You do not need to carry cash and your card account balance will bear interest as per the Bank’s terms, applicable to company current accounts in the respective currency. You can pay electronically for goods and services (at POS terminal devices and via Internet) and withdraw cash (from ATM terminal devices or POS in the Bank’s branches or at other banks), both on this country’s territory, as well as abroad. The card is also compatible with the latest methods for contactless payment. Using a business card enables you to effectively separate your personal income and expenses from you company ones, while paying with the card to your suppliers. To that same account you can order additional cards for your company’s employees with predetermined individual utilization limits. You will receive detailed monthly statements for the card account transactions. 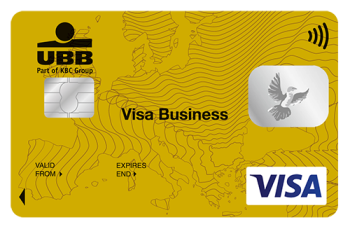 Along with Visa Business you obtain a free-of-charge international comprehensive travel insurance, providing you with coverage of damages, illness or other inconveniences while abroad. Upon occurrence of an insured event, please call the 24-hour hotline at +359 2 819 71 40. More information regarding risk coverage and the general terms and conditions of your insurance policy can be found here. The card is a personalized one and its front side is embossed with the company and cardholder’s names. By using a chip as data storage medium the card has been given maximum degree of protection against forgery, as well as during payment. Upon a lost or a stolen card, you can block it immediately by calling the 24/7 hotline of United Bulgarian Bank’s Card Center. In view of ensuring your security the Bank will determine card utilization limits. You are provided with the option to receive SMS notifications of each card account movement exceeding BGN 100. What transactions can I perform with the card at АТМs (automated teller machines)? What transactions can I perform with the card at POS terminals?